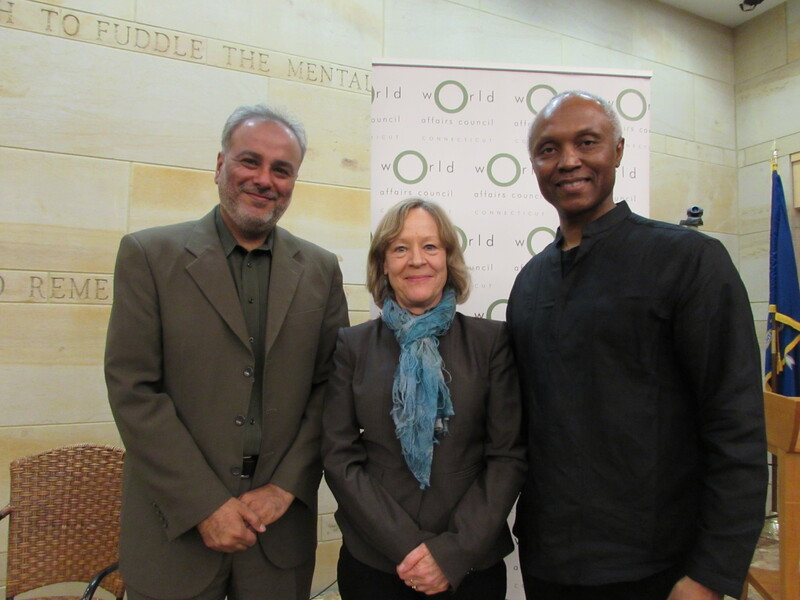 On March 26th, the World Affairs Council hosted Dr. Suad Anwar, mayor of South Windsor, CT, and author Okey Ndibe to speak on radical Islam at the Mark Twain House. Moderated by Heidi Hadsell of the Hartford Seminary, the panelists touched on the development of extremist groups ISIS and Boko Haram as well as Western attention and responses to their rise. 125 people attended, including 8 teachers and 24 students, contributing to an engaging and active Q&A session afterwards. 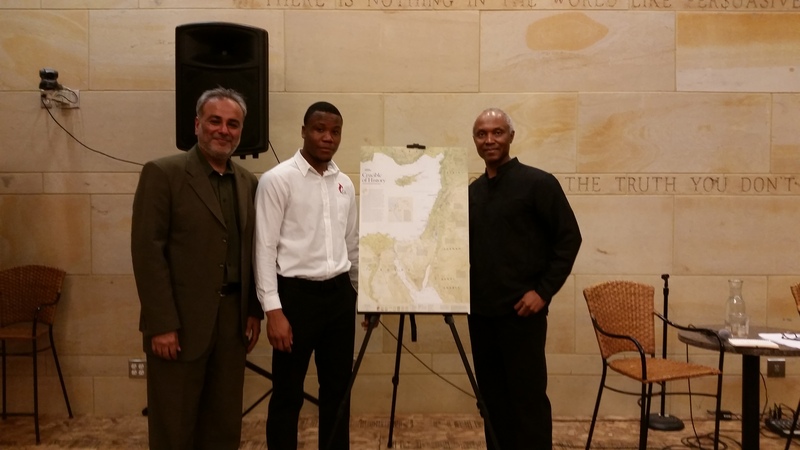 Panelists Saud Anwar and Okey Ndibe with WAC student. Both speakers cited geopolitical conditions as part of the rise of these groups. 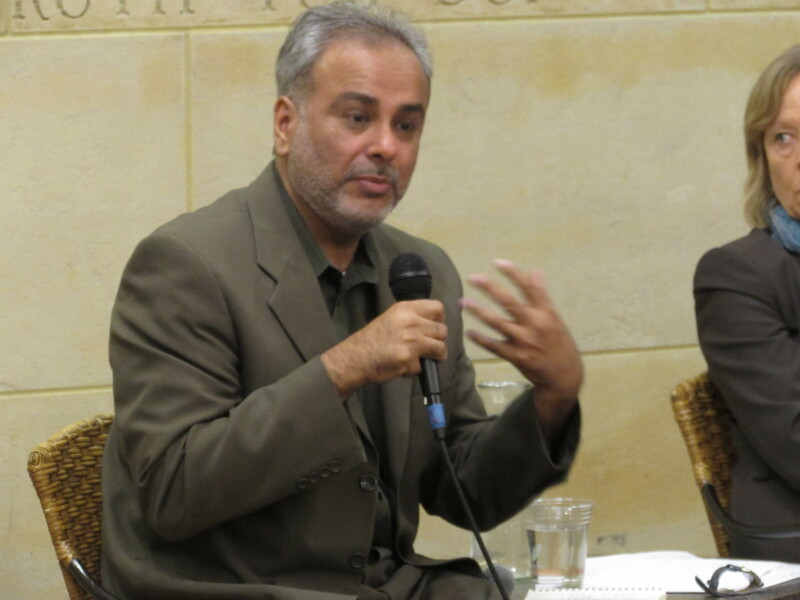 Dr. Anwar looked to U.S. military actions in Iraq as helping to create a political context allowing ISIS to gain power. Dr. Anwar additionally outlined four pathways by which an individual might radicalize: in seeking revenge, seeking identity, seeking status, or seeking a thrill. He warned of providing positive feedback to any of these, including labeling these movements as “Islamist” and promoting that identity. Ndibe cited Nigeria’s corruption and unequal economic growth as part of Boko Haram’s entrenchment. Where the Nigerian government was delegitimized in failing to care for or represent its citizens equally, Boko Haram found opportunity to step in. Both panelists also commented on how the US and the West should proceed. There is no question, Ndibe said, that some measure of force will be necessary to contain and weaken these groups. Regional governments are taking the lead in combating ISIS and Boko Haram, but the US, UK, and EU have valuable resources to contribute, especially in intelligence sharing. He also pointed to the organizations’ sources of artillery and funding as weak points to be targeted. Dr. Anwar cautioned against direct military intevention, pointing out that US involvement in Iraq helped set the stage for ISIS. Even while debating how best to combat ISIS we are funding al-Qaeda affiliates fighting Assad in Syria. We cannot have it both says, he said, so we need to return to our values and really examine why and where we are going to war. “We should not be making money by killing people,” Dr. Anwar asserted, citing US private enterprises that had benefitted from the wars in Afghanistan and Iraq, and we need to think in long-term policies. Right now, he concluded, we think in 2, 4 or 6 year policies corresponding to the U.S. election cycle, but this is not a sustainable model. One recurring theme was the relationship between moderate Muslims and radical Muslims. As soon as the religion card is played, Dr. Anwar asserted, things get tricky and the only thing that can trump it is the religion card. Radical religious movements need to be delegitimized by other members of that religion or religious community. 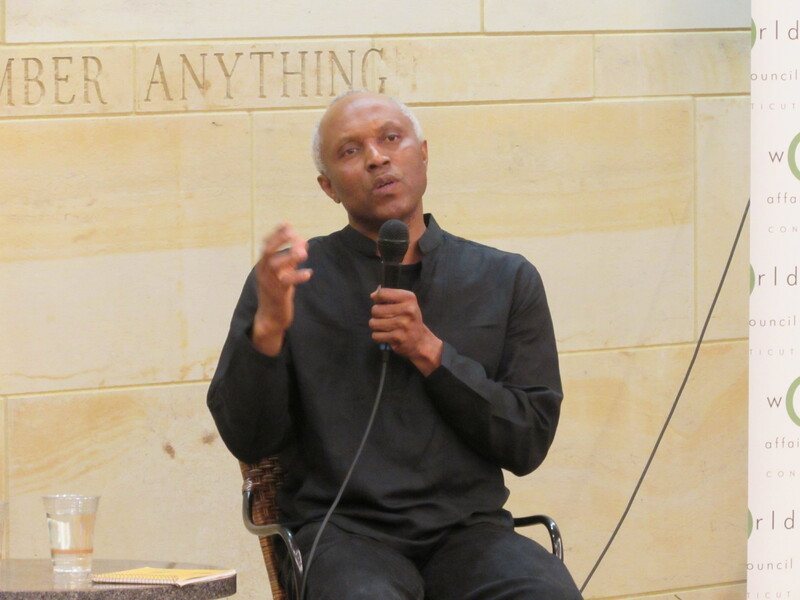 Ndibe similarly pointed to the early inaction and apathy of both the Nigerian government and prominent Muslim leaders in Nigeria to the early actions of Boko Haram as aiding its rise. Even two weeks after the kidnapping of approximately 300 schoolgirls in northeastern Nigeria, Nigerian public figures were publicly denying the event. Both panelists argued that there is a strong moderate Muslim voice overall; there is increasing backlash from prominent Muslim leaders in Nigeria to Boko Haram and it is Muslims who are fighting ISIS in Iraq. Both panelists additionally looked to the lack of coverage by the media of the moderate movement. Dr. Anwar cited anecdotes in which his views and actions were overlooked in favor of more newsworthy events, and Ndibe outlined the simplistic narrative conveyed by the media of “good guys” and “bad guys,” both of which grossly oversimplify the movements. Our country is the most pluralistic country in the world, Dr. Anwar concluded, and pushing education of different beliefs and cultures is incredibly valuable. The news of Dr. Anwar’s own election, as a Muslim, to the position of mayor here in Connecticut has had an international impact and better allowed him to promote his ideas of education and cooperation globally. A greater understanding of the diversity within the Arab or Muslim world is key to empowering moderates to combat extremist or radical movements both here and abroad. Next Post China and the United Nations – In Connecticut!